Sunday brunch is special for our family because this is the time we set aside for our “date” with Andre. It is bonding time which we use to introduce new cuisine, expand his vocabulary and discuss his likes and dislikes (for a 2-year old, he has very well-defined opinions). Choosing a restaurant does not require much thought. The only rule to remember: No french fries. This Sunday we were parents on a mission – out to scope a location for the upcoming celebration of Andre’s 3rd birthday. Too bad Paeng’s Bowl has been transformed into a giant hole waiting to be converted into another colossal condo. The only other viable bowling venue in Makati was Rockwell. Rockwell always presents a conumdrum: Where to eat? We walked up and down the restaurant row before we were drawn to an old friend: Pazzo. Miles and I have sorely missed Pazzo and El Cuento which disappeared from the Glorietta landscape about 2 years ago. 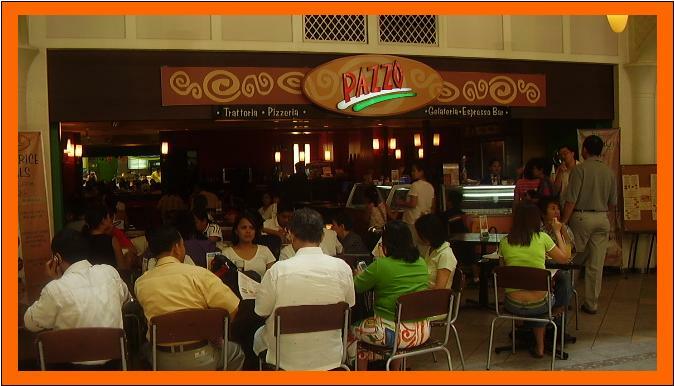 Pazzo is always a great place for bonding with friends and family. The servings, while generous, do not overwhelm. I especially love their thin-crust pizza with arugula and prosciutto ham. The pastas are also quite tasty and relatively guilt-free. For the budget conscious, they have also devised a lunch menu composed of appetizing meals which are not your run-of-the-mill fares. Where else can you have beef tenderloin tips taliata for P190 or chicken al forno with mushrooms, bacon and al jus for P140. Yummy. Pazzo is also child-friendly. Andre easily settled into his leatherette children’s seat and made himself busy twirling his fork around spaghetti and meatballs. He was adamant at demonstrating his newly discovered skill to us, never mind that his shirt and shorts were anointed in the process. The strawberry shake was not to his liking (he doesn’t like pink drinks) but he loved slurping on the ripe mango shake. All in all, a very successful lunch. As an added bonus, since we paid for our meal via my BDO mastercard, we were able to get free garlic bread. It was garlic bread like nothing we had ever had before – freshly toasted foccacia bread smothered with at least 2 cheeses, chopped spinach and chili flakes. It was well worth the gazillion calories that I’ll now have to spend the rest of the week working off. Pazzo can be found at Level P1 of the Rockwell Power Plant Mall. Tel. 756-5011.